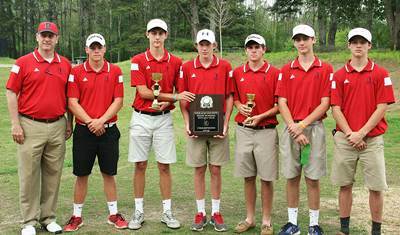 The Dunwoody Wildcats set a new county record with a team score of 300 to capture the 2015 DeKalb County Boys’ Golf Championship on Tuesday at the Sugar Creek Golf Club despite the wet conditions. The Wildcats led by low medalist Peter Trask had four players shoot under 80 on the way to the their seventh consecutive title including last year’s tie with Arabia Mountain following a three- hole playoff with the teams tied as darkness fell on the 2014 Championships. 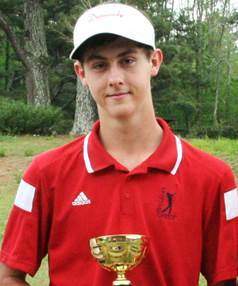 Trask won low medalist honors after a two-hole playoff with Arabia Mountain’s Noah Kuranga after the two ended the day tied at 73. Kuranga come up just shy of the low medalist honors as his put on the first hole of the playoff rolled to the lip of the cup and stopped just short of falling in for the winning shot. Trask who had putted from the fringe put in a short putt and the two remained tied after getting a par-4 on the No. 1 hole at Sugar Creek. Dunwoody’s Peter Trask won a thrilling two-hole playoff against Arabia Mountain’s Noah Kuranga to win low medalist honors. Trask took the momentum by stroking a long drive down the middle of the par-5, No. 2 hole to set up his eventual win as he put his second shot on the fringe of the green. Kuranga’s third shot was well short of the green, but he would not go easily as he put his fourth shot just short of the hole to force Trask into getting up and down with a birdie to be able to win the match. Trask’s first putt rolled even with the hole and Kuranga sank his par putt easily. Trask then rolled in his short put for the birdie and win in another exciting finish to the County Championship. Dunwoody’s other low scores for the team total of 300 came from Davis Brainard with a 74 (37-37) for third, Corey Sullivan in fourth with a 75 (40-35) and Tim Trembath in sixth with a 78 (39-39). The 300 broke the record of 301 set in the 2013 Championships by Dunwoody. Defending individual champion Cameron Wyatt of Martin Luther King Jr. came up short in the individual honors taking fifth with a 76 (42-34) on the day. The Lakeside Vikings came in second for the seventh consecutive year with a team total of 362, five strokes better than in 2014, followed in third by last year’s co-champion Arabia Mountain at 385, Druid Hills in fourth with 403, Chamblee in fifth with 411 and Cedar Grove in sixth with 429 to round out the teams with four qualifying scores. Lakeside was led by Tony Bryant with an 83 (43-41) good for seventh place. Tucker’s Donald Miller was eighth with an 84 (45-39) followed by Dunwoody’s Brox Labus with an 85 (41-45) in ninth and round out the Top 10 was Lakeside’s Brennan Cox with an 89 (48-41). 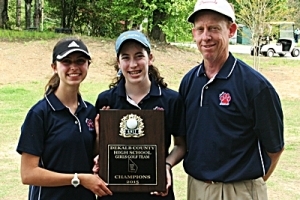 The Dunwoody Lady Wildcats made it two titles in a row as the only girls’ team to qualify for the team championship. The Lady Wildcats shot a team total of 211which was 12 strokes (223) better than a year ago. 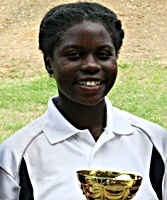 Arabia Mountain’s Mariah Kuranga captured her second consecutive DeKalb County individual title with a round of 75 (40-35). She chopped eight strokes off her 2014 winning score of 83. Arabia Mountain’s Miriah Kuranga ran way to her second consecutive county golf title with a round of 75.
finish second overall while teammate Olivia Vergura shot a 107 (49-58) to take third.